Beyond Reconstruction: What Lies Ahead for Young Palestinians? Yet to translate such declarations into action, policymakers will need to look beyond today’s urgent demands for humanitarian and reconstruction assistance and recognize the importance of another trend: the Palestinian economy is increasingly fragmented, and the weakening economy is coinciding with strong demographic pressures driven by a youth bulge. In this context, how will young Palestinians attain the basic levels of economic security and prosperity that are enjoyed by their peers in developed countries? To answer this question, it is worth examining the main demographic and structural challenges that will face the Palestinian economy for the foreseeable future. Fertility rates in the West Bank and Gaza, while declining, remain higher than every country in the Middle East with the exception of Yemen. (Recent data shows that the average Palestinian woman has 5.6 children, compared to 3.2 in Egypt and 3.5 in Jordan). This means that youth are, and will continue to be, a large share of the population for some time to come. 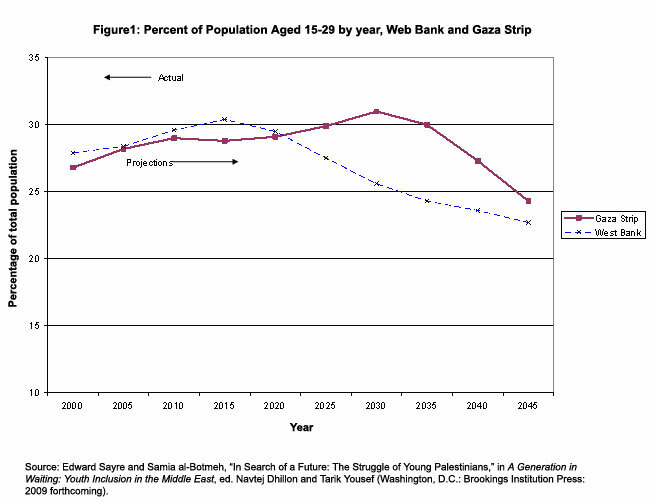 In the West Bank, the youth share of the population is expected to peak soon, but is projected to stay above 25 percent until at least 2030 (see Figure 1). In Gaza, an estimated three-quarters of the population is under the age of 29, and 15- to 29-year-olds will continue to make up about 28 to 30 percent of the total population until 2035. Thus the youth bulge in the Palestinian Territories is not a passing phenomenon; it will define Palestinian society for another two and half decades. If young people are engaged in productive roles, the Palestinian youth bulge can be a positive factor in economic development. Human capital is the main comparative advantage that Palestinian Territories have over naturally resource-rich countries in the Middle East. Yet, as in any economy, a large cohort of young Palestinians will continue to exert pressure on the education system and labor markets. In the education system, the youth bulge will test efforts to expand access and improve quality: the number of youth requiring an education is expected to rise by 50 percent in the next twenty years. Enrollment rates are rising across the board – at the primary level, where access is nearly universal, and also at the secondary and tertiary levels. 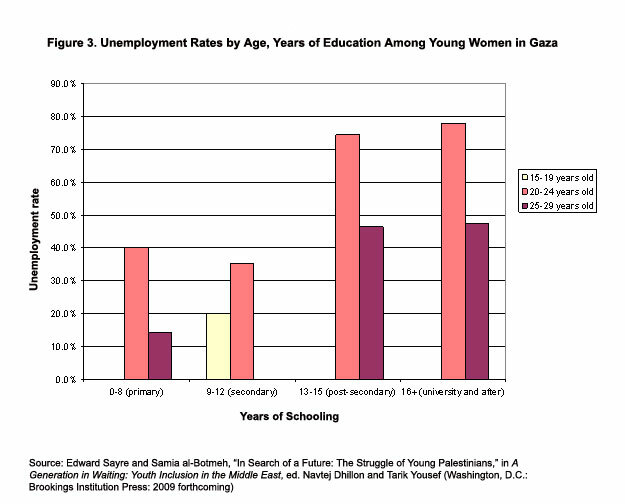 Women are now, on average, attaining higher levels of education than men in the West Bank, and in Gaza they are equal. But it is in the labor market where demographic pressures will cast their greatest impact. With the Palestinian labor force continuing to grow at a rate of about 4 percent per year, how will the economy absorb a growing pool of educated workers? The combination of a large, youthful population with a fragmented and besieged economy does not spell easy solutions for development. Yet, the international community has continued to fiercely promote economic development in the West Bank and Gaza as a necessary ingredient in achieving lasting peace between Israelis and Palestinians. Since the creation of the Palestinian Authority (PA) in 1994, financial resources have poured in to match the rhetoric: net official development assistance to the territories, from both individual countries and multilateral donors, has totaled over $1.1 billion per year since 2001 (constant 2006 USD) and amounted to $14.3 billion from 1995 through 2007. Yet, despite generous assistance from U.S., European, Arab and Asian countries and multilateral institutions, GDP per capita in the Palestinian Territories has declined by about 30 percent since its peak in 1999. To explain this contraction, Edward Sayre posits that the political situation has in fact divided the Palestinian economy into three distinct and isolated zones. Ramallah, the seat of PA administration, comprises its own “rentier” economy that sustains the local population via the lifeline of international aid that flows through the city. As more Palestinians relocate there for access to employment and services, property prices in Ramallah have been rapidly rising. A second, broad zone covers the rest of the West Bank, including the cities of Khalil (Hebron), Jenin, and Bethlehem. Scattered with road blocks and checkpoints, the greater West Bank is a collection of largely informal markets. Families are dependent on farm income and aid, or “remittances,” from Ramallah. Internal restrictions of movement raise the costs of transporting goods within the West Bank, and use of the crossings to access Israeli and world markets is subject to tightening security restrictions. “Land scarcity in the West Bank,” a World Bank report states, “is more artificial than real,” as Palestinians cannot access or administer large swaths of this land for resource and development needs due to Israeli restrictions. The final, and most desperate, zone is Gaza: a tiny, patch of land with 1.5 million residents, few natural resources, no access to international markets, and some of the highest fertility rates in the world. Unemployment rates are ballooning and the private sector has virtually ground to a halt, with access to imports being almost exclusively restricted to humanitarian items. 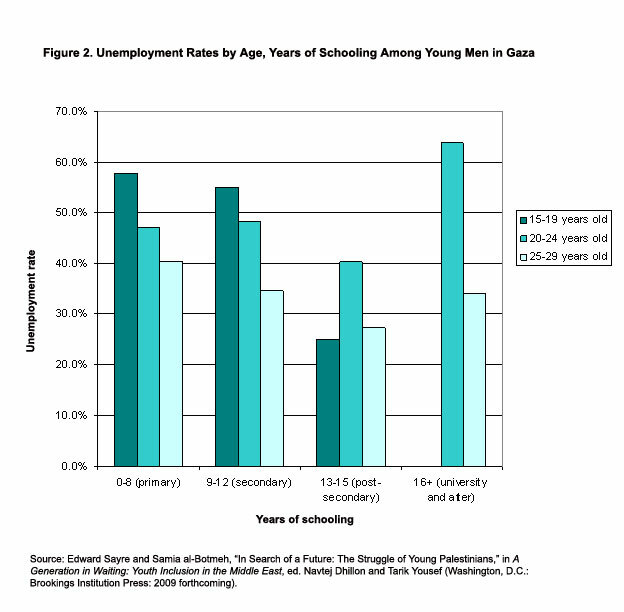 Youth unemployment in Gaza is particularly staggering, with nearly 64 percent of university-educated men between the ages of 20 and 24 unemployed (see Figure 2). The situation for young women who are seeking jobs is even worse (see Figure 3). Thus, while international donors have offered generous amounts of aid to develop Palestinian social and economic sectors, this assistance has not been able to overcome the structural incongruities that lie at the root of the problem. The major brunt of this is being borne by Palestinian youth. A generation ago, Palestinian workers took up jobs in the Israeli labor markets. This option is now largely closed off to today’s young workers. In the last oil boom, migration to the Gulf acted as a path to employment but this has slowed drastically as Gulf countries recruit higher numbers of Asian workers and now face the effects of the global economic downturn. The private sector is unable to act as the engine of job creation due to movement restrictions and limited or no access to outside markets, which have raised the costs of doing business. The only remaining option is turning to the public sector, which has become increasingly dominant in the Palestinian economy: in 2006, 56 percent of men and 80 percent of women in Gaza worked in the public sector, with lower rates in the West Bank. In the medium to long term, the public sector will not be able to accommodate the growing number of youth seeking jobs. When looking beyond short-term relief, what will be the engine of job creation for the Palestinian economy? Three broad options come to mind, each of which has significant political ramifications. The second option is the development of a sovereign Palestinian economy that is able to stand on its own by achieving greater integration with regional markets. Central to this arrangement would be an opening in trade possibilities for the territories, including access to the port at Gaza. Even so, as Fischer et. al argue, that transaction costs to trade with Israel should be minimized, as Israel is the “largest economy in the region” and seems to have the greatest potential as a trading partner with the West Bank and Gaza, followed probably by Jordan. However, as Palestinians saw during the negotiations of the Paris Protocol in 1993, an eventual free trade agreement with Israel may come at the expense of access to Israeli labor markets. In any case, an independent Palestinian economy that is integrated more fully with the rest of the Arab world would only be attainable if certain parts of the equation were to fundamentally change. Without lasting peace that ensures free movement between the West Bank and Gaza, the removal of the roadblocks within the West Bank, and direct access to export markets, the Palestinian economy will continue to suffer. If the donors that attended the Sharm El-Sheikh conference and regional policymakers are able to keep that in mind, then perhaps this option – and Secretary Clinton’s vision of a prosperous future for Palestinian children and youth – can become a reality. Third, there is the unfortunate possibility that things continue much as they are now: the fragmented economy is propped up by international aid for as long as possible while a political solution is sought. This final option would spell the continuation of the status quo: a collection of territories fragmented into the rentier city-state of Ramallah, the struggling areas of the greater West Bank, and the subsistence economy of Gaza. As we have seen, this option is untenable and will guarantee that the skills and potential of yet another generation of young and educated Palestinians is left to atrophy. Diana Greenwald contributed to this report. Youssef Courbage, New Demographic Scenarios in the Mediterranean Region (Paris: National Institute of Demographic Studies, 1999) cited in: Alan Richards and John Waterbury, A Political Economy of the Middle East: Third Edition (Boulder, CO: Westview Press, 2008), 86. Data is from the OECD-DAC (Organisation for Economic Co-operation and Development, Development Assistance Committee). http://www.oecd.org/dataoecd/50/17/5037721.htm. (accessed March 6, 2009). This does not include unofficial assistance and measures aid that was actually disbursed, thus the commitments made at the Paris conference in December 2007 and, of course, the billions committed last week in Egypt are not included either. Claus Astrup and Sebastien Dessus, “Exporting Labor or Goods? Long-term Implications for the Palestinian Economy,” Review of Middle East Economics and Finance 3 (1) (2005): 39. Edward Sayre and Samia al-Botmeh, “In Search of a Future: The Struggle of Young Palestinians,” in A Generation in Waiting: Youth Inclusion in the Middle East, ed. Navtej Dhillon and Tarik Yousef (Washington, D.C.: Brookings Institution Press: 2009 forthcoming). Stanley Fischer, Patricia Alonso-Gamo, and Ulric Erickson von Allmen, “Economic Developments in the West Bank and Gaza Since Oslo,” The Economic Jounal 111 (2001): F273. A. Arnon and J. Weinblatt, “Sovereignty and Economic Development: The Case of Israel and Palestine,” The Economic Journal 111 (2001): F296.